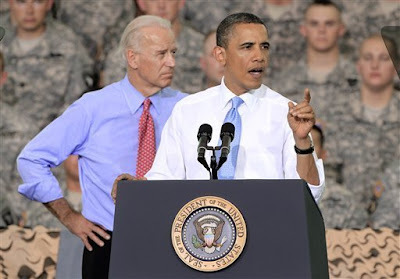 In his first Presidential visit to Kentucky, President Obama addressed a cheering crowd at Ft. Campbell today for a short (16 minutes) but rousing speech. Acknowledging that more soldiers have been deployed - and killed - from Ft. Campbell than anyplace else in America in the war in Afghanistan, he praised Kentucky's Special Operations forces who were part on last Sunday's raid in Pakistan. He also awarded the commando units the "Presidential Unit Citation", the highest honor a President can give to a military unit. The identities of those Ft. Campbell soldiers specifically involved are being kept secret to protect from potential terrorist reprisals, according to the Lexington Herald-Leader. Not everyone is so enthralled with Obama's handling of the situation. Discrepancies abound in the many conflictions versions being told by officials regarding the circumstances of Bin Laden's death. Some are feeling deja vu of Bush's claim that Iraq had "weapons of mass destruction" that turned out not to be true, as it sinks in now that Obama escalated the war in Afghanistan because that's where Bin Laden supposedly was - and now we're being told "oops, he was in Pakistan all along, sorry." And adminstration officials have stated that Bin Laden's death will have no impact whatsoever on the timetable for withdrawing US forces from Afghanistan. The President also made no mention of the top-secret experimental stealth super-copter that crashed during the raid. The official explanation being given is that it got "caught in an air vortex" due to temperatures higher than expected. That doesn't exactly sound like much of a super-copter, if you ask me; but they didn't ask me. Then too, there's the whole can of worms about all the reports that Osama Bin Laden has actually already been dead for years now. 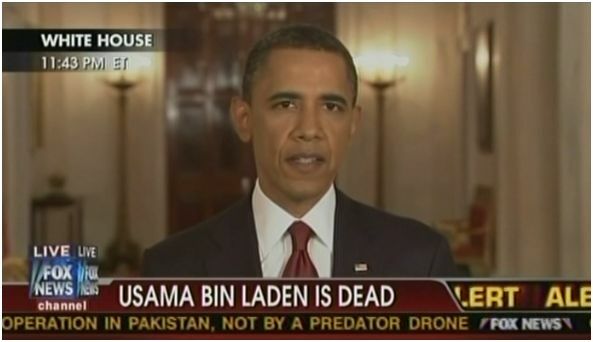 FOX News and the Pakistan Observer reported in 2001 that Bin Laden died from a lung complication. There was even an article about Bin Laden's 2001 funeral in an Egyptian newspaper. And in 2002, the FBI's counter-terrorism chief Dale Watson said he believed Bin Laden was probably dead. Whatever the real truths are behind world events that have caused President Obama's hair to start greying prematurely, I just hope and pray he knows what he's doing. Even though he's keeping the identities of the soldiers a secret, I'm not sure even admitting that Kentucky was involved in the Bin Laden raid is a good idea. Feel me?